Table Bay over the years has undergone great changes as Cape Town has grown. 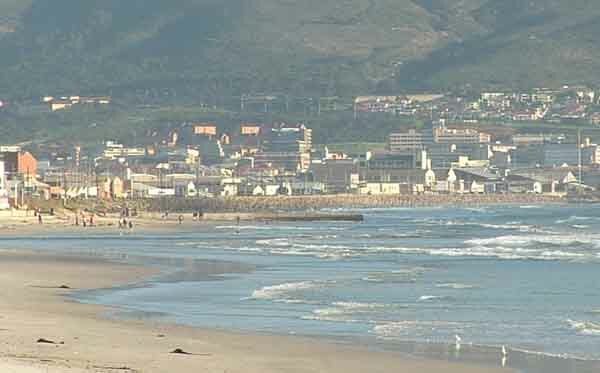 When van Riebeeck arrived in the Cape in 1652 the coastline along the bay was pristine beach and especially in the city where it was approximately two kilometres closer to the mountain than it is today. The edge of the bay was lined with beaches and above the highwater mark were sand dunes which seperated the marshy areas behind them from the sea. When the new Table bay Harbour was built way back in the 1950's not much was known about management of dunes and the result of the construction of the harbour and the reclaiming of the land now known as the Foreshore resulted in currents being changed to the detriment of the dunes on the far side of the bay. With the building of the harbour the beach in Cape Town disappeared for good and the coastline was altered for ever. The sea began eroding the dunes along the Woodstock beach and soon it was necessary to find a way of keeping the sea at bay. A concrete wall had to be built and strengthened with dolosse to keep the sea out of the burgeoning industrial area of Paarden Eiland. As the walls were built the seas just attacked the dunes further down the bay and erosion kept on happening. Today walls have reached as far as the mouth of the Milnerton Lagoon. The dunes further north along the coastline are still there but as wind and water have been eroding them as well the authorities have decided to protect them by natural means. What they have done is to create a new dune in front of the existing dune along the length of the bay. On top of this dune and the older dunes which had very little vegetation before they have planted marram grass which catches wind blown sand and drops it into the valley between the two dunes thus building the dunes. To protect the areas that have been replanted and to help the grass establish itself the areas have been cordoned off and wooden walkways have been built through the dunes in certain places to allow access to the beach. The results have been good and over the years since the project began the grass has grown and many other plants indigenous to the dunes have reappeared on them. Problems of sand being blown onto the roads behind the dunes have been overcome and the erosion of the dunes has stopped. Of course from time to time when very rough seas occur the dunes are attacked by the waves and erosion takes place. 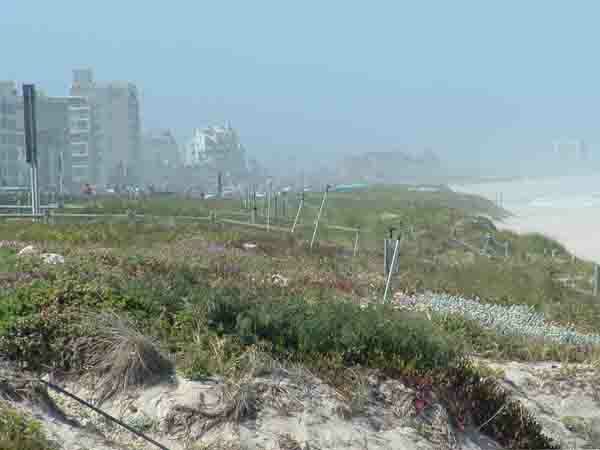 The area thats takes the brunt of the erosion is near the Milnerton golf course where a tar road that had been built along the top of the dunes has slowly disappeared as the sea has eroded its base. Over the past few months construction in the container harbour in Cape Town has been taking place and questions in the press have been asking whether further erosion along the Milnerton coastline will be occurring. The experts say "no" as this time around a proper study of the impact of the construction has taken place before building began. We'll just have to wait and see what the impact of our next large winter storm will be on the coastline. In the meantime however the sand dunes are there and the flowers on them are giving visitors a spectacular show.